The Gunners captain believes an improvement against top-six rivals under a new coaching regime can be credited to a different mindset. LAURENT KOSCIELNY HAS aimed a veiled dig at former Arsenal boss Arsene Wenger, with the Gunners considered to be ”more intelligent” under Unai Emery. Under a previous coaching regime, in more recent times, the north London outfit often struggled in meetings with fellow members of the so-called ‘big six’. Those failings contributed to Arsenal missing out on top-four finishes in each of Wenger’s final two campaigns at the helm. The Gunners are back in the hunt for Champions League qualification this season and have moved in front of the likes of Manchester United and Chelsea in that race. A 2-0 victory over the Red Devils in their last Premier League fixture lifted Emery’s side above their old adversaries. 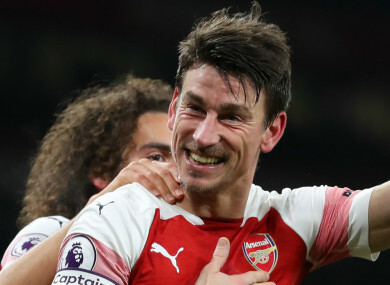 A much-improved record has been enjoyed in such clashes in 2018-19, with Koscielny putting that down to a different approach with a new manager at the helm. The French defender said: “Our record against the other big six teams this season is positive. We have won 12 points compared to six last season. It shows how we are approaching those games differently. “It is not just about attacking. We are more intelligent, we are more measured in our plans. The manager is using different formations and it shows his flexibility and the players’ too which is a good thing. Arsenal’s record on the road is still a cause for concern. While they have taken 13 wins from 16 games at Emirates Stadium this season, suffering only one defeat, it has been a different story outside of north London. As things stand, Emery’s side have just five away wins to their name. From 14 games, they have collected a further four draws and suffered five defeats. Addressing those faults is among the next issues for Emery to address, but for now he has his team heading in the right direction after stepping into the shoes of an iconic figure – with Wenger having moved on after 22 years at the Arsenal helm. Email “Koscielny makes veiled dig at Wenger's approach as Arsenal become 'more intelligent' under Emery”. Feedback on “Koscielny makes veiled dig at Wenger's approach as Arsenal become 'more intelligent' under Emery”.